Specialised reefer owner and operator Seatrade has taken delivery of its second freezer carrier, mv Orange Sea, which followed the delivery of mv Orange Spirit on 19 December last year. According to Seatrade, the Orange Class reefer vessels have been built in accordance with the latest environmental and operational specifications to trade with frozen and refrigerated commodities like fish, potatoes and citrus. The vessels have been designed with a strong focus on high seas transhipment operation, "heralding a new era in the specialised reefer industry and supply chain". The Orange Class vessels will be commercially operated from the GreenSea Pool in Antwerp, Belgium and the technical ship management will be taken care of by Seatrade Groningen BV in the Netherlands. 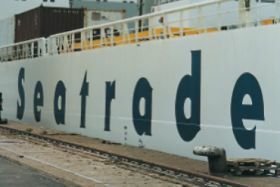 "Seatrade continues to explore opportunities to modernise and increase its fleet with further acquisitions of newbuildings and/or modern second-hand tonnage, combined with possible strategic alliances with third-party owners in the same segment," the group stated. "This latest development is another evidence of Seatrade’s long-term commitment to the specialised reefer industry; enabling the company and its worldwide network of dedicated offices to further improve service levels to its customers and partners in the years to come."